Are you ready for a BBQ Ride? Bangaloreans love their bikes as much as their food. Most Bangaloreans love to ride a bike and eat delicious food. However, two young Bangaloreans merged their passion for bikes and food to create a unique business concept which is ‘BBQ Ride’ or ‘Barbeque on a bike’. The creators of ‘BBQ Ride’ concept Arun and Krishna Verma are brothers and students of commerce. They have penchant for bikes as well as serving food. This led to India’s first ever concept of a ‘food-bike’ just like a ‘food-truck’ in Bangaluru. Arun transformed his RE Bullet Classic 500 into a portable barbecue cooking and vending unit. Arun was inspired from the yesteryear movie ‘Sholay’. In this movie, the actors Amitabh Bachchan and Dharmendra ride a Bullet with a side-car. Arun got an idea to convert the side-car into a portable barbecue unit. It took about 3 months for Arun to design the side-car unit. He fabricated the portable barbecue unit on the side-car itself. 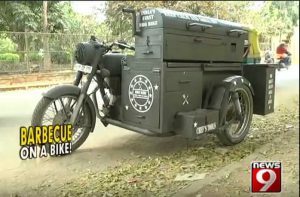 He attaches the BBQ side-car to his Bullet and serves Veg and Non-veg Grilled dishes in Bangalore for a reasonable price. Previously, Arun operated a 'Food-Truck' thru’ which he served the people. However, he started facing difficulties due to growing problem of traffic, narrow roads and limited parking spaces in Bangaluru. A bike is very ideal to ride and park in narrow lanes and roads alike. So, he decided to explore a new idea of cooking & serving the barbecue dishes on a bike. Thus, he created the concept called ‘BBQ Ride’ i.e. Barbecue on a bike. Arun claims that this concept is the first of its kind in India. He named his creation the ‘BBQ Ride – Chill While We Grill’. Currently, the BBQ Ride is available in Bangaluru. However, Arun has already appointed few franchises in Chennai, Hyderabad, Visakhapattanam and Pune which shall start the service soon. This bike has a side-car with barbecue pit and a hot pan setup. It also has space to hold a 5 kg. LPG cylinder and to keep cooking utensils. Additionally, it has storage units to keep the raw material. Arun painted his barbecue with military-green theme which stands out. 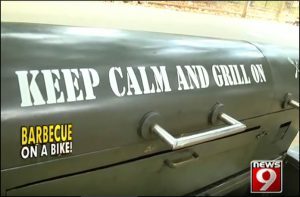 The barbecue grill has a cool message ‘Keep Calm and Grill On’ on its body. Arun serves both veg and non-veg grilled dishes. The bike can serve upto 120 customers in one trip. The menu consists of Grilled Chicken Drumsticks, Chicken Stripes, Chicken Burgers, Rolls and Barbecued meat for non-vegetarians. It also serves Grilled Paneer with Capsicum and Grilled Pineapple Wedges for vegetarians. The dishes are yummy according to the consumers. The BBQ Ride serves in the areas of Hebbal, Jakkur, Kamanahalli of Bangaluru suburbs in the evenings. So, if you are from Bangaluru and a bike-lover; it is worth visiting this food joint. Crankit wishes Arun and Krishna good luck in their endeavour...! Feline One: World’s Costliest Motorcycle, Whats it got? Volta ZAP: An ingenious transport for next-gen India! What is an autonomous car And How Waymo autonomous car company is building one?